Football/Basketball teams do tours were they visit other teams and play friendly games, in places they don't normally play. So how about a team of bloggers known as the 'Philofaxy All Stars', touring around each others blogs and doing blog posts on each others sites? The team would be 'managed' by Philofaxy so a 'fixtures' list would be known in advance and we would provide publicity for when the posts are going to be on line. The 'crowd' would hopefully follow the tour around the various sites and bring each blog more traffic and hopefully revisits as well. How will this work? Well once the team has been assembled and some initial 'training' has taken place, we will start getting people to volunteer which blogs they would like to do a guest spot on. Whilst you can potentially guest post on every site in the tour, this might get a bit much if the team grows in size. So if for instance the team grew to say 12 sites, but you only got 4 different people guesting on your site, you would only be expected to write 4 posts on those 4 visiting sites. It will be up to the host and the visitor to agree the topic of the guest post (it might not be about Filofax organisers) and they will also agree the timing of publication. The tour could start in say 2-3 weeks time, once we have established who is interested and we have settled our 'fixtures list. But there will not be a rush to complete all the fixtures, it is intended that they will be spread out over the months ahead until the end of the year. The intention being to space out the guest posts on the various sites to provide plenty of variety for readers (crowd). I have already approached a couple of people to see if they will be interested in being on the 'team' and they seemed very positive about joining in the fun. How about you? When I'm not reading about filofaxes, I can be found doing the accounts for a petsitting/dogwalking franchise business, seeing my shiatsu clients (a Japanese complementary therapy) or throwing people around (whilst doing a martial art called aikido). 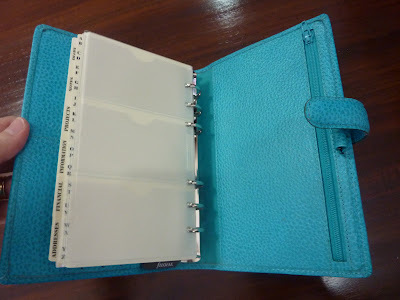 You can read my filofax blog posts here (more to come!) or see what I'm up to on Twitter here. I bought my first Filofax in 2009, which was a cherry personal Classic. Once it was delivered I was hooked! 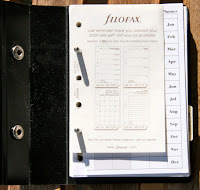 I've only used Filofax, but as a compulsive window-shopper I've considered Succes, Day Timer & many others. My wonderful crimson personal Malden. My cherry Classic sadly developed some strange creasing & cracking to the leather, & Filofax kindly offered to replace it even though I hadn't bought it from them. After reading all the Malden enabling posts, I decided I had to have one & got Filofax to send me a Malden as my replacement instead. Two, but soon to be one - I would imagine the majority of Philofaxy readers own more! I recently decided to become a one-filofax woman, partly to cut down on my possessions & also as the other filos were no match for my magic Malden. I have owned my cherry Classic as mentioned, a purple Finsbury mini & a chocolate mini Cross. I sold both the minis on eBay & am also now selling my personal Kendal. I'm a Getting Things Done & Zen Habits fan, so I use it to keep all next actions, MITs (most important tasks) & details of projects/goals in one place. It's also used for notes, inspirational quotes, sudoku & reading (I pulled apart a couple of small books & hole-punched them). The flexibility of being able to move things around compared to normal notebooks, & how gorgeous they are. A holder for my iPod touch. I love purple, so more in this colour would be great. It stays on my desk next to my PC most of the time, but I have started taking it out with me more recently in my red leather Saccoo bag or my Ellie spotty Old Bag. I'm a real Malden fan, so I'm trying not to look at the other sizes or colours. Umm, no. Well, not for the time being! I spent £41.00 on my cherry personal Classic, which I was very pleased to get in a sale. Lots of lovely info about filofaxes & that it feels like a community. It's one of the websites I visit the most often. Wasting Light by the Foo Fighters. Thank you Anita.... and before you ask, no you don't have to be a crimson Malden owner to appear in this series! After my post about Filofax Wishes and my complaint about wanting more variety in diary formats, I decided to play a little bit with week on two pages possibilities. It's hard to find a week on two pages format in the Personal size that I like. I prefer days as columns, but the columns have to be really narrow to fit in the personal size pages. So I tried something else. I divided each page into 4 rectangles and experimented with days and a space for notes. But, this layout didn't flow very well throughout the week. So instead I tried having Monday through Wednesday plus Notes across the top row, and Thursday through Sunday across the bottom, and I liked that better. What do you think about this layout? Is this a weekly layout you would like to use? Does anyone know of a brand that already prints this layout in the weekly pages? When? - Sunday 7th August from 10am (US East Coast time), 3pm London time, 4 pm Paris time 9pm Jakarta etc. See the clocks at the top of this post to see roughly what time you should be on line. Hope to be chatting with you on Sunday 7th August. 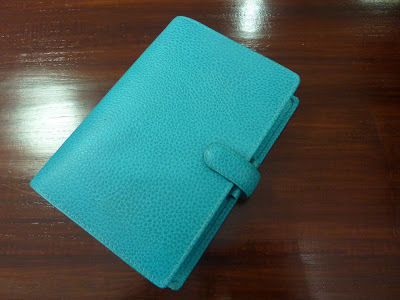 Here's my new personal size Aqua Finsbury Filofax! I tried different lighting and backgrounds to try to show the true color, and this was as close as I could get in my house, but it still doesn't represent the brightness of the Aqua color! I love the super-saturated color. 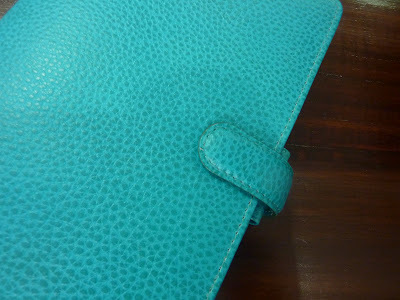 I first saw this at the Filofax shop in London last year and I thought the color was gorgeous. Who knew it would be discontinued so quickly?!? I was really lucky to nab this one at www.ILovePens.co.uk before they were all sold out. 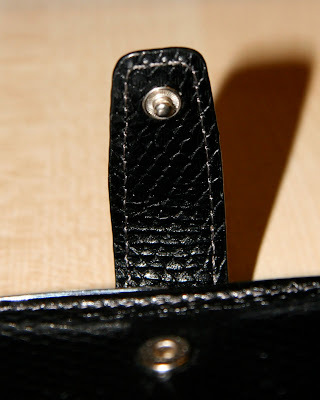 Here is a close-up of the closure strap. I like the simplicity of the smooth closure. Even though I don't normally use all the standard tabs, for some reason I still prefer these designations over the numbered tabs that come in some binders. I've been wanting this Filofax for awhile and am really happy it's here! Here are some of the enablers bloggers with Aqua Finsburies of their own that encouraged my wanting one: Zoe, Caribbean Princess, Qavit and especially Twinkleberry (whose photos I find so inspiring!!). So, thank you all for making me want this Filofax because I'm really glad I have it!! It's the last weekend in July. It's hard to believe but kids in the US and Scotland start school in just a couple of weeks! (Those lucky kids in England still have another month yet to enjoy their summer vacation). This weekend I'll be doing my Monthly Review of July. Do you do monthly reviews in your Filofax? As we get ready to enter the last month of summer, how is your Filofax helping you plan the rest of your summer and into the autumn? Are you starting to make end-of-the-year plans yet? And as always on Fridays, feel free to discuss anything Filofax-related. My first actual Filofax is my beautiful crimson Malden personal. I bought it the beginning of May this year. (And how have I lived this long without it?!) 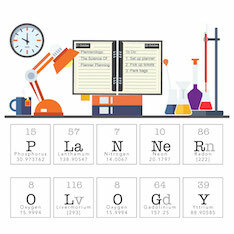 I had been experiencing "planner angst" for years. After haunting Plannerisms, I found Philofaxy and seeing all the beautiful Filos made me long to go back to a ringed binder system. I looked at many of the personal sized FFs on flickr and here on Philofaxy and was so enthralled with the Malden, I just had to have it. I have always had some sort of paper based/analog planner book - I have used DayTimer, Franklin Covey, DayRunner for ringed format, and Moleskine (always have a soft spot for Moleskine), Staples brand, Brownline/Blueline for bound book format. I have tried a few different formats for my work planner needs and that is still evolving, but for my personal needs, I am in love with Filo. In March when I decided to try a ringed format again, I bought a cheapie DayTimer binder in the personal size and figured after a few weeks that the format would work for me, so I bought my beloved Filo Malden. Well, as I may have alluded, I LOVE my crimson Malden personal. The personal size is working so well for me right now. I may consider an A5, but it would be for some as-yet-undetermined purpose so that I wouldn't be lugging it around. My bag is ridiculously heavy enough! Aside from my (beloved) Malden, I am currently waiting for a Finsbury pocket to come in the mail. I found it on eBay. I plan to use it as a notebook for my purse/bag for those quick errands/grocery trips where I wouldn't always bring my Malden. I have mine stuffed full! The first half of it is calendar/diary pages (along with tabbed monthly calendars). Since I got it in May, I've been trying different diary page formats. I think the two-days-per-page will be the winner for me. The rest of it is divided by tabs according to subject. I did a post on my blog about what I've got crammed in between the covers. Probably the flexibility. No, wait - its gorgeous good looks. No, wait ... its adaptability. Awww, everything! My main (ongoing) problem with bound-book format planners and notebooks was that my random notes and information was in there all willy-nilly. If I was looking for some particular piece of information, I had to rely on memory for a range of dates to start looking for the info. Very aggravating. I love that I can make the Filo do what I want, and can change it up as my needs fluctuate. I love the Malden (maybe I mentioned that before?) but I would have liked it to have another pen loop, and for the pen loops to be just a tiny bit wider to accommodate all my favourite pens. (The cheapie DT binder I was using before I got Malden had two pen loops and I quite liked that.) And maybe slightly bigger rings in the personal size as I like to cram a lot of pages in mine. When I'm working (home office!) it's open on the desk next to me. When I'm not working, it's open on the end table next to my LazyBoy. If I'm away from the house, it's in my big Roots tote bag that I call a "purse". So far my Malden personal, which was $99 US (a little less once converted to CDN). I would spend more, but would probably draw the line at the personal Finchley ($125). Oh, just everything! I love the sense of community and the exchange of such great ideas. I love seeing how others use their Filos and I really like seeing photos of everyone's jam-packed binders and scribbled pages. There is so much information in both the posts and the comments, I love to browse through it all the time. Why?! WHY would you ask me this?! I haven't bought any music for years. We have satellite radio in my van and our car and it's always tuned to The 40s on 4 (big band and swing). I did, however, just buy a CD by The Boxer Rebellion called "The Cold Still". I heard one of the songs on an episode of NCIS and it reminded me a lot of Cold Play. I hunted down the name and bought the cd. I've never had much luck in downloading music for my MP3 player, so I don't bother with that. Thank you Terri for agreeing to go under the spotlight. OK the Press Stud as they are also called, has been around a long time and in use on Filofax organisers since they were invented as far as I know? Some organisers haven't used a press stud on the closing strap, some use a fancy latch closure like the Deco. They used to be marked with the makers name PRYM, but these days they appear to be marked with Filofax, so may be they buy them in enough numbers to get their own name on them. So the press stud comes in two halves, the female bit in the picture above, and the male in the picture below. I will let you work out why I've called them that, without getting rude! But it follows the usual plug and socket rules... think about it. So with me so far... in the picture is my Chameleon. 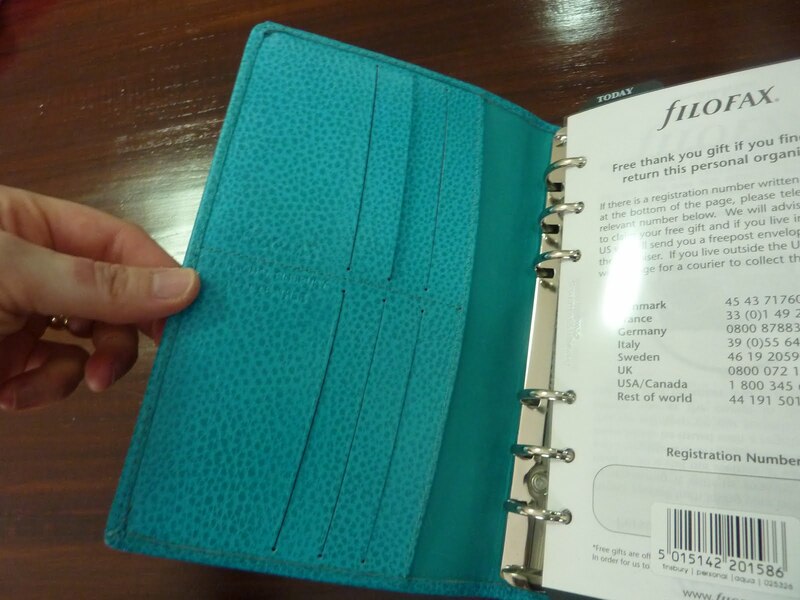 Notice which part of the press stud is located on which part of the Filofax organiser. So now we switch to my Malden. Now your turn to play 'spot the difference'.... apart from one is black and the other is red! A quick check of my mini collection and the Finchley is the same as the Chameleon. The three Maldens are all the same as in the picture above. Finsbury is the same as the Malden, likewise my old Winchester is the same as these two. It of course doesn't matter, but I was just intrigued when I noticed the difference!! Now before you go away... on the inside of the strap you might notice three letters embossed in to the leather very close to the main body of the organiser. For instance on my red Malden they are 'SIV' and VBV on the black Chameleon. These we believe are quality control letters to identify batches of organisers or similar. I won't claim to have discovered these.... that honour goes to someone on the Philofaxy Flickr Discussion Group back in 2008. They aren't unique so you can't use them as a serial number, but it might be useful to make a note of the letters if you ever send a Filofax back for repair, you would know if you get the same one back again or not. We do this every now and then in the hopes that Filofax Headquarters will listen and heed our call: let's list our biggest Filofax wishes. 1. Slimline A5 Finsbury. Many of us have been asking for years for a slimline A5 binder. Filofax has come out with a couple of options that I'm not satisfied with. The A5 Adelphi, despite its smaller ring size, has a bulky gusseted pocket in the front and a notepad in the back that prevents the book from being slim. And the new A5 Luxe may or may not be a true slimline, but I'll never know because the price is so far out of my range. So I'm going to get really specific about what I want. I want a slimline A5 Finsbury, in colors for men and women. I don't want any bulky add-on pockets, no closure or strap, and I want the cover to be just wide enough to accommodate tabbed dividers. Rings at 23 mm or thereabouts. Please, Filofax. 2. More diary formats. This has been much discussed here on Philofaxy. Specifically I want a personal size week on two pages with the days as vertical columns, in English only, and the back sides of the pages LINED, not diary pages printed back to back. This is the way Franklin Covey makes them, and yes I could just go over to FC and buy theirs but I'd rather have Filofax pages because they fit in my binder better. I also want tabbed monthly grid calendars on two pages with the backs of the pages LINED so I can splice my months in with my weeks. And I'd like new, interesting diary layouts for the A5 size. With that larger page size they could go nuts with the formats. 3. Archival, acid-free paper for ALL their paper, diary inserts and all other pages, for those of us who want to keep our pages forever. Honestly I'm shocked the pages are not already acid-free. I'd like the paper quality in general to go up, and have less (preferably no) show-through with liquid inks. Fountain pen friendly paper would be a great option. But definitely archival, please. Those are my biggest Filofax wishes. What are yours? The lovely Filofax King has let me do this guest post for some advertisement! It comes with both a 2011 and 2012 diary so you are set for the next year! The competition ends on 31 August, and then from 1 September to 15 September the best photos will be going to the public vote! I thought it was the fairest way! So if you go on my blog it has all the instructions, and what you need to do, its really simple! But the two most important bits are to join Filofax College on Facebook and then post your picture in the album competition photos! Alison works full time from home on her business ‘Write to Win’. She has been a member of the Philofaxy community for some time now and has just recently started her own business blog. I didn’t actually buy my first Filofax – I had it given to me. My eldest brother used to be a ‘fly around the world’ executive and used to get lots of free airmiles and goodies from British Airways. They had some personal sized Filofaxes commissioned and he got two over a period of time – one of which he gave to me. I remember it was a real status symbol – it was a lovely grained supple Navy Blue leather (when everything else came in black only!) with ‘British Airways’ embossed on the front. Not only did it make me feel very glamorous and trendy, but I reached my zenith regarding personal time management – I’ve never been so organised before or since! I think this had something to do with the exclusivity of it! 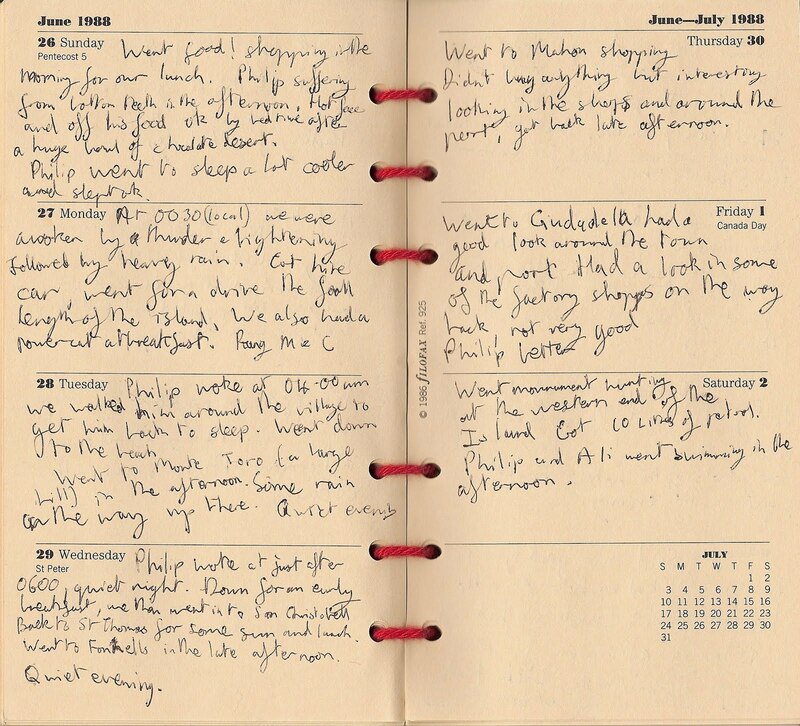 Having got the Filofax under my belt – I was a real convert to ‘time management’ systems. My ultimate goal was to go on one of the new TMI courses – but only the highest levels of management were sent. Feeling slightly miffed about this, I bought their system myself (without the course) and figured it out and used it for some time. I never got the buzz from this that I got from that first Filofax though! However I did love the TMI inserts and I really do feel that Filofax lets us down a bit with insert design and paper quality – especially for the A5 size. Well, normally I like my accessories in bright colours. However I recently bought an A5 Amazona in Black and totally fell in love. I bought it as a work Filofax and am to be seen subtly stroking it when I think no-one is looking! I also have a bit of a thing for pens (I prefer a fountain pen but the current inserts make this impossible) so I use a very nice Mont Blanc Meisterstück ball point that I have had for some years. It writes beautifully and looks amazing in the pen loop of this black Amazona. I’m not sure I wish to be called to account in public on this – but here goes! A4 Classic Red, A5 Black Amazona, A5 Red Amazona (recently bought cheap and undergoing loving restoration), A5 Aqua Finsbury, A5 Vintage Rose Finchley, A5 Bronze Snake Domino, Personal Ivory Deco (soon to be sold), Personal Pearl Panama (also soon to be sold), Slimline Personal Scarlet Adelphi, Pocket Special Edition, Pocket Almond Amazona. Gosh – this is scary I didn’t realise I had so many! I am a bit of a cheapskate so have bought them all either in sales or on Ebay. A5 Black Amazona – this is my work FF. It has a day per page diary and will be used to track work, goals, projects and so on. I work in my own business from home so decided to keep work separate (at least for the time being!). A5 Aqua Finsbury – I’m planning to use this for my personal life and development, hobbies and projects. A5 Vintage Rose Finchley – this is my household FF. I have my food shopping lists, menu planning, Xmas cards/present planning, Flylady ideas, recipes and so on. Pocket Special Edition – this is my handbag diary which goes everywhere with me and has all my appointments in. I like that I can scan the pages and see weeks and months at a glance. I’m not sure about the others just now – the personal sized ones will be on sale just as soon as I can get some decent pictures taken. There are two things I like – one is the range of binders so something for everyone – I just need to remember that I don’t need one of every style they bring out! The second thing I like is the versatility – I like to write, I like to see things on a page and I like to customise. Its biggest bonus has to be that it can be all things to all people due to its design. Fantasy: one that is a deskfax size, takes standard size paper and folds down into a mini size when travelling! Oh and a reasonably priced A5 hole punch! Reality: No bulky pockets on the outside (this feature actually annoys me about the Special Edition and the Deco – a waste of space for me). I like sumptuous leather inside and out, and would prefer the larger ring sizes on all the leather binders as well. Inserts: A much wider range for the A5 - as in the personal. Much better paper quality that will take a fountain pen. 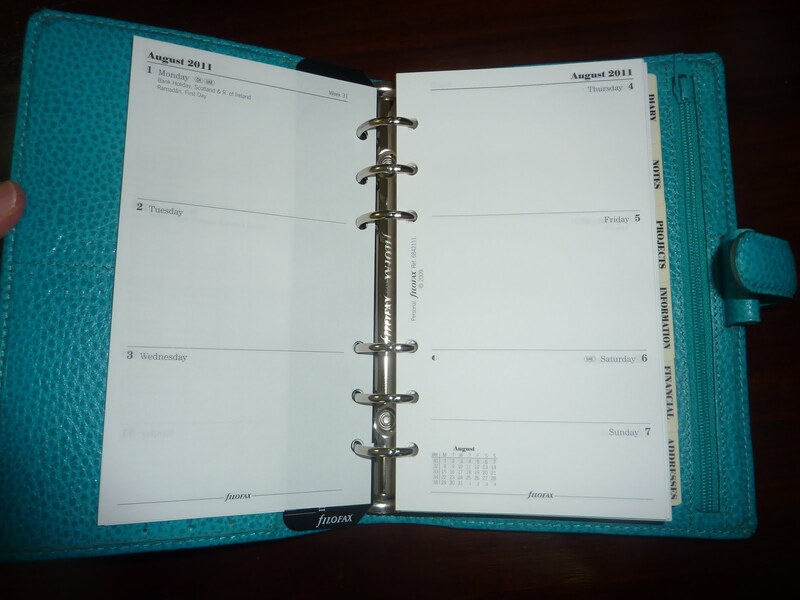 A customisable option so you can have the diary designed to your spec then printed – a bit like this planner that Laurie reviewed. Coloured rulers for the A5 instead of boring black. A wider range of index tabs for the A5. More coloured inserts. Usually in my hand or briefcase. I am in love with the Plum Osterley at the moment. The website doesn’t give an internal view so I’m not sure if I would love the inside as much. It looks like it has a brass button on the closure, so hopefully the hardware inside is gold coloured – yummy my favourite! I can’t possibly buy it because 1) I have too many binders 2) I can’t afford it and 3) my husband would divorce me!!! I’ll have to wait for the lottery win! Probably the A4 Classic which was around £95 when I bought it. All the others I have had good deals on. I love the community and the fact that when I am having a rotten day, I can have a quick chat with some like minded souls! I love the weekly roundups of other blogs (I have to settle down with a nice cuppa when those appear! ), Tuesdays and Fridays for chatter and the very informative articles our illustrious leaders post! I really look forward to checking the blog every day. I’m hoping to get to a meet up one day! As someone said before this must be a trick question. The only thing to moan about is that there is not more than one post a day and not more chat – just because I have an insatiable desire for all things FF! I could chatter away all day! I suppose I should take up twitter or facebook for more chat, but it’s not really me! I can’t remember and I would probably be too embarrassed to say! My most recent singles downloads were probably ‘The Rose’ by Francoise Hardy and ‘Hallelujah’ by k.d. lang. I’m a big fan of Queen, Enya, Gary Moore, Elton John, Amy Winehouse (not everything! ), Bette Midler and Adele – and I also love show music, opera and classical. It all depends on my mood. So you see I am easily pleased! Some more posts for you to read over the weekend. Enjoyable they certainly should be! You should also be aware of a new Yahoo Group called Time and Life Management set up by David Popely following discussions on Free For All Friday yesterday. The group is open for everyone to join in. It's Friday.... the weekend is just around the corner.. but before you disappear to enjoy lots of sun, relaxation and fun times... why not tell us all about what you have changed recently in your Filofax. But of course it's a Friday so do feel free to discuss anything Filofax related. 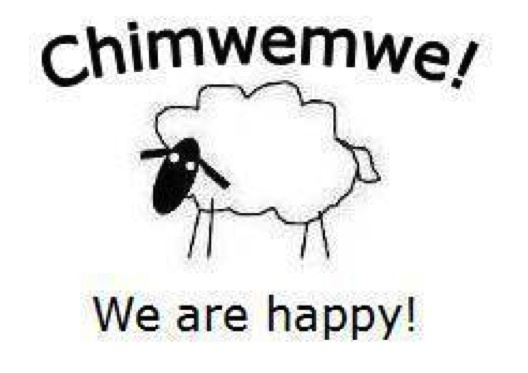 Bonne weekend..... as they say around here! Hi, you all know me as ‘Saffy’. My name is Fiona and I live in Hampshire, U.K. I first came across the Filofax brand when I went to live and work in London in 1986. I was given a hand-me-down Filofax and that was it, I was hooked for life. I live with my husband, teenage daughter and two cats. 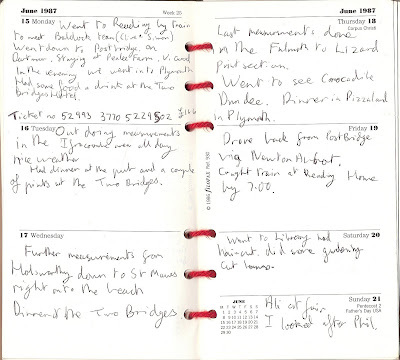 In London in the 80’s it seemed everyone had a Filofax, my work colleagues, strangers on the tube, people walking down the street and I HAD to have my own. I coveted a dark green (Winchester I think) with the smaller ring size of (19mm?) and would go every lunch time to Ryman across the road on the High Street and agonise over which one I would eventually buy. Back then they were around £54.00 if my memory serves me correctly which at the time was nearly half my weekly wage. I was eventually given my first Filofax by my boss, a second hand Winchester (I think) in maroon, it had gold embossing with ‘Harrods’ so doubly impressive to a 19 year old, Harrods and Filofax all in one – WOW! It needed a bit of TLC as it was dried out but those older Filofaxes were made of thick robust leather and meant to last forever. I still have it and it is now a time capsule of the 80’s. For a couple of years I used Franklyn Covey because the company I worked for were putting their staff through the training course and you came out with the basic vinyl model in black. Sadly I missed the course but did get the binder which I loved due to their 2DPP layout and time management. The starter pack had helpful notes on how to use the organiser and get the most out of it. The cross referencing was invaluable. I can’t really pick just one. My current favourite would have to be the Plum Compact Osterley because it is the newest and I felt like I waited so long for its release before I finally made it mine. My husband bought it for my recent birthday. In some ways it reminds me of that coveted green Winchester in size and seriousness. I love the slimlines too, I have Adelphi’s which seem ‘fun’ compared to the serious Osterley. And then there is the Baroque which is much like the Malden. I love its soft squishy leather and the note pad pocket in the back and laying flat from the start and, and, and, see, I can’t just pick one. Umm,err, ahh, I am really embarrassed by this question and I have terrible Filofax angst and guilt. I will admit to owning 18 (+) thanks to some serious bargains on EBay and at TKMaxx and of course thanks to the ‘enablers’. The ones not counted don’t get a guernsey until I find uses for them or in case I change my mind and decide to sell them on to a loving home or gift them to friends or family. I guess I am a collector. Everything and anything, I have many uses. I like to compartmentalise my life into different Filofaxes so I know exactly where to look for information. For example I have a family organiser, storage filo, quilt-o-fax (inspired by Sharon’s craft-o-fax), master copy of all personal information including family history, passwords etc. I also have one set aside next to the computer with just A-Z tabs and behind those are all my logons, passwords, user names etc which I call my ‘computer companion’. This is particularly handy and it is slowly filling up with my husband’s logon info as well, he-he. Prior to owning a Filofax I would carry an address book and a diary and a note book (all very small ones) so when I discovered the Filofax contained all three in one leather bound file I thought it was an ingenious idea and had to have one. I love that it could replace all three of my little booklets in one. They are so hangeable. I also love that you can personalise it and adjust it to fit into whatever lifestyle you have and whichever direction life takes you with the different variety of refills be it serious for work or fun and colourful for play. You don’t need to be an executive or high flying professional you can be a stay at home mum, student, retiree, etc and it will fit in with your needs. I also love the sheer variety of binders, inserts and accessories we all have our own individual set up and binder preference which makes them so personal to us. I have two that I dream of. The first one would have to be a personal sized binder with the smaller 80’s ring size (19 mm). A luxury printed leather like the Osterley/Amazona in a mid-dark green colour, it seems I am still hankering over that green Winchester. The second one would be embossed leather like the Baroque but on the outside. I would love this in two colours, white and red. Two pen loops of course and probably a secretarial pocket in the front inside and the inside back cover would either have the note pad pocket or a simple full length ½ width pocket like in the slimlines. That way I can keep my jotter pads in the back out of the way. It also goes without saying, it would lay flat right out of the box. And an external pocket like on the Kendal would be handy too. Quite simply, in my handbag. I also have a love of handbags so I am never without my Filofax and handbag. Again, not just one but two. The Luxe compact in red and the Enigma in White. When I saw the Enigma in the Neal Street shop I was quite surprised, it was silky smooth to the touch and the white one was lovely. The pictures don’t do it justice. I may consider buying the white Enigma as a future purchase if Filofax have another post Christmas sale of 50% off all binders. But no plans at this stage for any new purchases. Although the purple Song Bird may be in the running, for my daughter, of course. I don’t need any more Filofaxes! The most expensive is the plum Compact Osterley although my husband bought it for me as a birthday present so does that count? The Philofaxy community is one of the friendliest and helpful I have come across. When I first discovered Philofaxy I lurked in the background just reading all the posts and comments and finally plucked up the courage to leave a comment. Discovering a community of fellow Filofax junkies out there also made me feel a bit more ‘normal’. The meet ups in London are the highlight of my year. I was going to agree with a previous ‘Reader Under the Spotlight’ about the brownness but now that it is ‘Cotton Cream’ how could I not like that? This is embarrassing. I rarely if ever buy CD’s or download music. All that gets played in my house (full blast, may I add) is teenager style music eg; Rihanna, Taylor Swift, Justin Bieber, Eminem and some band with a scary name that I have no idea what they sing but their lyrics sound offensive.......ha-ha,..........I am officially middle aged after saying that. SNARL wrote this ditty about the Midwest Meetup held in Chicago on 16 July 2011. She regrets that she forgot to take pictures, but skhen took what pictures she herself remembered to take. A Filofax sharing frenzy ensued. Sandra’s take on the matter follows SNARL’S illustrative and entertaining narrative. Finally--we were going to Chicago to meet-up with some fellow Filo-users/lovers! Yay! I was bummed 2 people couldn't make it, but I really wanted to go to Chicago anyway. If I were lucky and could stretch out the kid, maybe we'd go to the art museum, we'll see. So, on Friday I got everything ready including the mental prep necessary so that the kid would be on his best behaviour. I tried really hard to do as much morning stuff as I could - set the coffee maker on timer, put away all the dishes, shower, double check to make sure I had everything, go to bed early. I had to make sure I was organized before my day trip to meet up with a bunch of organizers, so I checked everything again. I made it to bed around 12.30-ish, which is pretty good for me. I woke up super early thinking I smelled the coffee, and I patted myself on the back for that. Of course, those were all brain power thoughts as the coffee didn't fly on auto pilot on account of operator error - forgot to check the actual TIME of the coffee maker. 7.26. PM. Heh heh. Nice one SNARLing. But the rest of the morning was ok and we were out the door by 7.28. I wanted to leave at 7. Google maps says it's 3 hours and 22 minutes away, but Chicago's an hour behind so I thought we were fine for a 10a meeting. Oh, but wait - forgot there are tolls. Should have gotten cash YESTERDAY arrghh! so had to make a quick run to the bank. 7.42 - off we go. It was a pretty good drive. Milo had a new dvd to watch and oh yeah, right, I drive kinda fast. When we saw the Chicago skyline it was almost 10a Indy time. Cool. I was hoping to be a bit early as skhen said street parking – I’m not that familiar with Chicago, but when I was in Brooklyn, 10am on a Saturday is right on the cusp of finding good street parking. Then we got a "running late" text from skhen - I was like - but it's only 9-ish-but then remembered the four kids she has plus whatever drive time, so that was nice of her (editor’s note: 20 minutes-and I did text SNARL… ). And then, of course, immediately after I responded 'ok almost there', completely on cue from the heavens or from Hollywood, Milo threw up. Heh heh. Poor kid. Yeah, and mommy didn't bring any extra clothes just a hoodie, extra shoes and an umbrella in case it rained. I think he got car sick from my super fast driving (wha--?!) as he doesn't throw up very often. He was a really good sport about it all though and I was glad we had some extra time to clean up and stuff. Heh heh. Sorry kid, it's kinda funny. Once we cleaned up and came out of the bathroom and looked at muffins, he was A-O-K. Milo wanted to sit outside so outside we went. It was great people watching. There were a lot of younger people wearing all black and a couple with purple or green hair so I thought maybe there must be a hair school close by. (I kinda want purple hair. Maybe for the 43rd I'll do that.) Oh, and a ton of dogs. I follow the URBAN SKETCHERS blog so I thought I should try and sketch a bit but it was nice to just sit there and relax with the kid in this town soaking it all in, drinking Caribou Coffee while he played with Buzz Lightyear with the pop-up wings. FINALLY skhen arrived. Heh heh actually it wasn't much of a wait as it was nice and relaxing and we were enjoying it all. It was cool - TOTALLY like meeting an old friend whom I haven't seen in awhile. Chat chat chat, then little by little, things came out. I had decorated Altoids tins (Editor’s note: filled with goodies!) for little presents since one of the few times I was active on twitter (sorry - just not that into twitter that much but love you all anyway) I twitpic'd my drawer filled with a ton of these things and J asked what would I do with them and I said make gifts for you all - so sorry, J, you totally missed out! skhen seemed to like it so that's cool. And man she's got a bunch of great stuff! She had a classic A5 in brown which is really quite nice. It has a nice worn in look and felt pretty dense. and the A5 bronze snake Domino is really pretty too. I just got a dark brown A5 snake Domino that I want to use for a happiness/art binder and was completely overwhelmed by its size when I got it so it was good to see some up and running A5 binders. It'll take me awhile to get used to it - I don't think I could use it for my daily planner but it really should be perfect for a journal/art book. We'll see. I also loved seeing her different use of the Malden. It's interesting to see the same binder setup so differently than your own. It would be nice to have Malden innards for the Malden flickr pics. I'll have to take some this week (editors note: me too!) Anyway, the crimson is really nice, too. I'm almost tempted to get one (along with a bunch of others! ), but right now I'm all about the Chameleon. Skhen had a bunch of Finsburies - at least one in every size. I love the Finsbury. I like the worn-in look it gets. She had this one that was supposedly raspberry but it was more magenta-ish than the mini raspberry she had. It was really nice to see and makes me think maybe I can allow more colour in my life. Well, maybe. If they make them compact, that is (osterley osterley osterley). It was great seeing all these Filos. At one point, the Italian girl sitting behind us came up to us and I thought for sure she was going to ask us about our Filos, but no. She wanted to know the whereabouts of a grocery or something. Too bad for her. Milo was getting a bit antsy so we packed it up and went to the Kawaii store. So so so so Kawaii! It was hard to get Milo to let me look at things but, for the most part, I was able since I shouldn't be buying more stuff anyway. I was just glad to be there and looking at and touching things. So much nicer than shopping online! There was one thing, however, that I should have gotten but didn't: the blue kura toga pencil for @5.99. Oh well. I was surprised that skhen was able to control herself like she did (editor’s note: FabFrugal no spend challenge—so I had to behave). Man, if I had one daughter, I would have totally gone crazy in there - let alone three daughters (and one ds, Graham)! Of course, Milo was antsy and hanging out with the breakables (sign to leave) so we walked skhen to her car to see four more Filos (!) a Finchley pocket, two more Finsbury personals (including the magenta-ish one that I loved) and an A5 in Fins pink. Awesome. It just makes it all the more clearer that you really need to see these in person to get a feel for the different colours and styles. I wish we had Filofaxes at our local Staples like SOME people, but then it wouldn't be as much fun as meeting up with people like this. It was so cool meeting skhen for real (editor’s note: aw, thanks!). I wish we could have had more time to talk about planning and stuff like that (editor’s note: me too!) She was able to show me a quarter of the Women's Success Planner which looked a lot nicer than it does online. It's machine-made, yet hand-made-looking, flecked paper and the font and layout didn't bother me as much as I thought it would have - really nice and soothing, actually. A final thought: I think it would be awesome to have a non-profit organization with an annual conference with seminars of tips and demos of new products and stuff. We could all meet annually and write it off tax wise. Skhen and I are going to look into it and let you know. Hello, dear ones. SNARL and I met on Saturday in Chicago, Illinois, USA. We had two other Philofaxy fans that had to cancel at the last minute, and they were sorely missed, but there was no stopping this Filofax power duo. Well, trio--mini SNARL came along with his momma to the Windy City for the day. We met at a Caribou Coffee at Maxwell and Halsted in the University Village neighborhood of Chicago. UIC (University of Illinois -Chicago) was a few blocks away, parking was ample, and the weather was mild (quite warm (85F/30C, humid, no rain). After grabbing a coffee and starting a good, chatty visit, SNARL pulled out a small gift for me! Such a lovely surprise. I felt quite guilty as I did not procure one for her, but I did share some extra goodies I had on hand and will send a thank you parcel shortly. Buzz Lightyear made an essential appearance as well. Look at the tricked out Altoids tin! Woot! It was filled with goodies, but that is a topic for another post on my blog. Tin scoping out the Malden stack. All eyes on our Beloveds. An earlier stack attempt--but there were Filofaxes lurking about the meet up that have not yet graced us with their presence. I had a difficult time deciding which Filofaxes to bring as to bring all would be a bit heavy in my backpack (seriously). So, I brought 2 A5s, a personal, a pocket, and a mini. I did bring the others to leave in the car if a Filofax emergency presented itself. At the end of our visit, SNARL did walk to my car as we said our goodbyes to see some additional Finsburies and a pocket Finchley. But I digress--back to the binders! SNARL brought out so many lovely binders. She reminded me of a magician pulling a rabbit out of a hat: the Filofaxes and other journals just kept coming. I was most taken by the compact Chameleon in black. The small rings just looked so tidy and streamlined. Her orange pocket Finsbury was so cute, even though orange is not a color I gravitate to at all. She also brought a slim that I rather liked a bit. And then there was the Midori travel journal. I couldn't put that one down to take a picture. Total L-O-V-E with that one. And the Arc planner....*sigh*. Love the profiles of happily stuffed Filofaxes! The final stack, minus the stowed Filofaxes I did not carry with me. From top to bottom: mini Fins, pocket Topaz (might be a slim? ), pocket Fins, pocket Malden, slim Finsbury (I think? ), compact Chameleon, personal Maldens, brown Snake Domino, Chocolate Classic, bronze Snake Domino. We chatted and shared as long as the mini SNARL would tolerate and we next went to a small boutique called Kawaii Japanese Outlet. The store displayed lots of household goodies to peruse as well some neat stationery items. I bought a few things, but only what was needed in honor of the Frugal is Fabulous Challenge I am part of as led by CP and Imy. These minor purchases ($13.42 USD!) will appear in a future post on Miscellany of a Filofax Fanatic. One purchase for my dh--a spice shaker for the travel camper. Sadly, I had to scurry home at this point to my friend/babysitter before she totally lost her mind. I am so looking forward to future Meetups, here and elsewhere, as well as possible video conferencing at some point. And, I now have a friend (and a half--mini SNARL) in the bustling and exciting metropolis of Indianapolis, Indiana. SNARL insists there is "nothing to do there" with respect to stationery geekdom, so future Midwest Meetup locations are TBA. We both hope more Philofaxers can attend as it was even more fun than it looks. Thanks for reading! Thank you both for a detailed write up. So those of you attending the London meet-up in September (myself included) you can see what we have to beat now... there are going to be some heavy bags I think! Have you ever got curious about how the ring mechanism on your Filofax organiser works? On 'modern' Filofax organisers the cover over the mechanism is riveted on, so it isn't possible to see how it works, but on my old Winchester the cover just clips on. Being a curious engineering type of person, I couldn't resist having a look under the cover! Sorry for the quality of the photos, but taking close-up pictures of 'shiny' things isn't easy! So here are the rings closed, with the tabs 'up' so when you press down on the tab it presses the two strips of metal you can see running the length of the mechanism. These two strips you might notice are now hinged up slightly, so the rings open. The strips interlock at intervals along their length on alternative sides (the small half moons on the upper surface). These two strips are contained in a springy U channel, which is allowed to flex a very small amount for the rings to go from closed to open. But it is this channel that is the 'spring' and therefore it is this that keeps the rings closed. So to ensure you don't damage the mechanism, always use the tabs to open rings and use gentle pressure on both sets of rings to close them. Now I have seen inside I think I can see what could go wrong with the mechanism with the strips becoming out of their interlock condition and so they would just fall open or at worse come out completely. So what intriguing questions do you have for us this week? Hi all! I'm J, maybe better known as thecrazylifeofj and sometimes just plain old Jordan. I work for a small non-profit in Chicago, try to be outside as much as I can, and do my best to keep up with my crazy boys: Brian (the human aka boyfriend) and Frankie (the dog). When I'm not working/reading/sleeping, I try to write as much as I can about anything and everything over at my blog. I was a late Filofax bloomer, so to speak. While I remember seeing some Filos in a retailer years ago (and being shocked by the price), I didn't buy my first Filo until November 2010. It was a personal gray Domino. I've used most of them: Franklin Covey, whose inserts I love but binders I hate, other generics, and one called Blue Sky, which I used up until Filofax came into my life. I loved that it was a bound book, but just couldn't get the flexibility I needed from it. Sorry to the Domino, but there is no competition here. My Crimson Malden (personal) is without a doubt my favorite. I actually haven't even lusted after another binder since he arrived!!! Oh, and I did just get my best friend her first Filo (a personal Pink Finsbury) for dirt cheap as her graduation present! Not that she isn't worth the money of a full priced one. I'll have given her the binder by the time you all are reading this-- I'll update you on the reaction! EVERYTHING! It is seriously my lifeline. 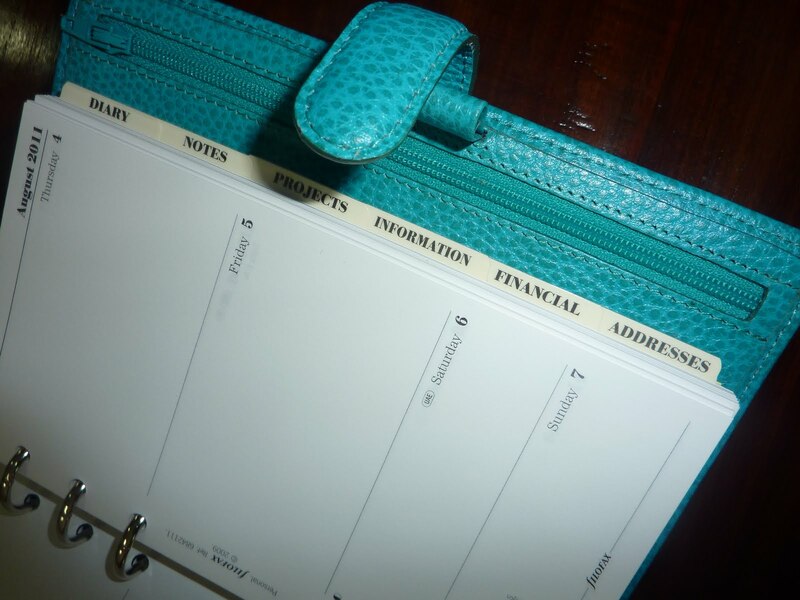 I use it for daily planning, notes, gratitude list, weather tracking, work and personal to-dos, bill reminders, blog planning, to read and watch lists, I could go on and on and on and on!!! I can't narrow it down to the feature, but a few of my favorites have to be: the beauty and quality of the covers, the rings!, the flexibility they offer, and the opportunity for me to be creative with my planning. Ooooo. It would have the Malden leather and ability to lie flat out of the box, HUGE rings (duh), a small button to change the color anytime I want, notepad pocket, and a secretarial pocket. Oh, and a leather smell that would never fade! Most of the time my Filo is in my handbag, which changes constantly. At work or home, it's always open on my desk. Since I keep my ID and credit cards in it as well, I've carried as a sort of “clutch” from time to time as well if I don't feel like carrying my handbag. I love a lot of them. I think the Osterley in Plum is divine. I'd also not mind having a mini or pocket Malden as a wallet- I'm still kicking myself for passing up a $30 pocket Amazona I saw in New York. And something has always drawn me to the regal look of the Finchley. But since I am saving for a few other things, mainly paying off my credit card and then a Kindle to celebrate, I don't see myself getting anything new anytime soon. That would be the Malden. But even then, I got it for $79 and had an additional 10% off on top of that! Even when I splurge I'm cheap! I'd have to say the fact that this is the only place where people don't find my obsession with my planner crazy! I honestly can't make people understand how awesome this community is. So thank you guys for the friendship. I wrote a while ago how I was amazed that something as simple as a Filofax has sparked a worldwide connection. A connection between the genders. Between races. Between religions. A connection between strangers who have become friends. Even though I haven't met the majority of you all, I feel like I have been a part of this community forever. Now, one of us just needs to win the lottery so we can have a worldwide meet up! The one and only thing I don't like about Philofaxy is this question! Because how could anyone find something to NOT like?!?! That would be Zac Brown Band, You Get What You Give. They are a country band (a genre I usually don't care for) but they are amazing! Thank you Jordan for agreeing to go 'under the spotlight'. 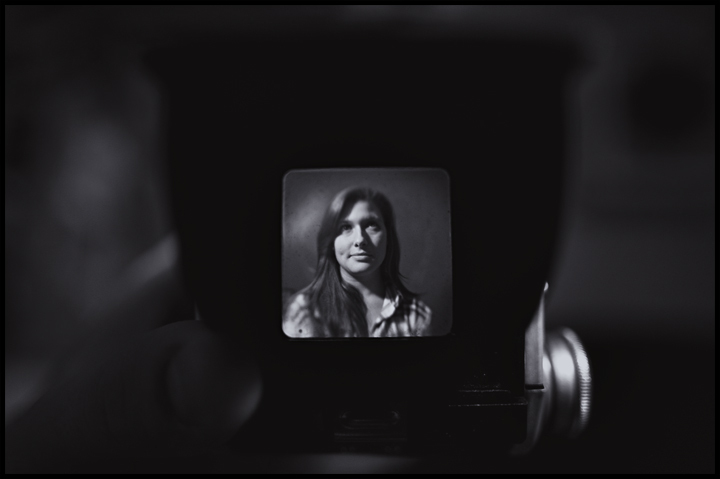 Great picture, taken through the viewfinder of your new camera by the look of it. 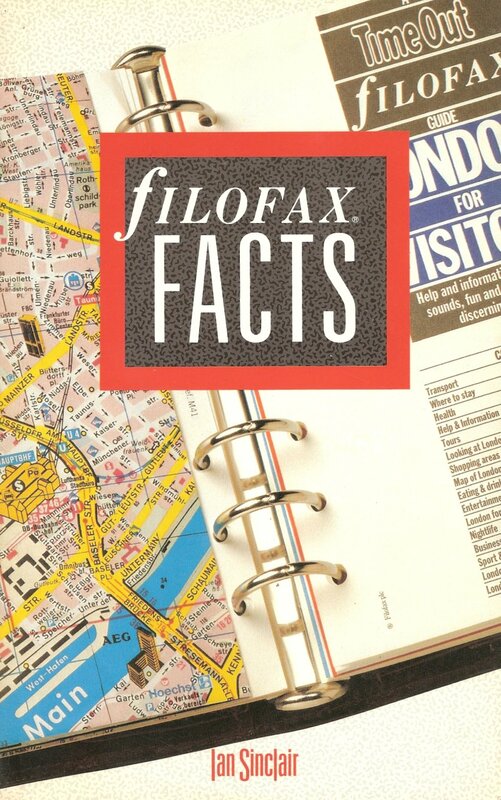 Another two copies of Filofax Facts have become available on Amazon UK See my full review of the book. And buy the book via the link below. This book doesn't come up for sale very often and when it does the price is often ridiculously high. A Peek in to My Calendar - HotchPotch Ehhh?? Do you ever look back in time to see what you were doing a year ago, five years ago, ten years ago etc? I used to be quite a prolific diary writer(for me) a few years ago, but less so these days. I'm sure it's a factor of getting older, the weeks go by quicker, when you look back trying to remember what year something was, it's always longer ago than you first thought. When ever I mention Filofax and my son is around, he always as a little chuckle to himself, but to be fair he does use a Moleskine notebook and uses it quite extensively. I silenced him one day though when I was able to produce my diary pages for the year of his birth (1987). He sat and quietly read them for a good hour... and with a gracious 'Thank you' he passed them back to me. So here is an extract from 'that diary' It's not the week Philip was born, I will save his blushes! It's a week I was working away from home down in the West Country with a radio measurement team. We were taking radio field strength measurements of an MF radio transmitter in Barnstaple, Devon to help prove a computer prediction model. I had sent this team of guys all around the country on this project, so it seemed only fair to join them for one of the trips! Nothing terribly exciting, but it I didn't realise until I read it again that I had been to see Crocodile Dundee in Plymouth! Some of you might recognise some of the place names! Here's another from 1988, notice how dark cotton cream paper turns with age! We were having a holiday in Spain. I was between jobs, just finished working in London and when we got back to UK I went to work in Surrey... there until 2004! Again nothing terribly exciting in my writing I will admit, but enough to stir a few memories of that holiday some 23 years ago! Philip was about 18 months old at the time. Just found in an entry after Christmas 1988 that 'Alison organised her Filofax' ah so now we know.... 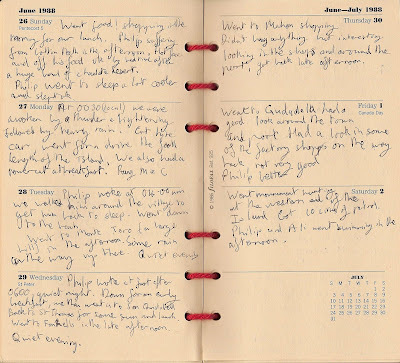 I went over to a week per page in 1989, but my diary notes fade out, which is a shame, but that's life I suppose. After a few years experimenting with different systems, I've recently "come home" to Filofax and it’s amazing to find such a lively online scene among Filofax fanatics – with Philofaxy leading the charge, of course. 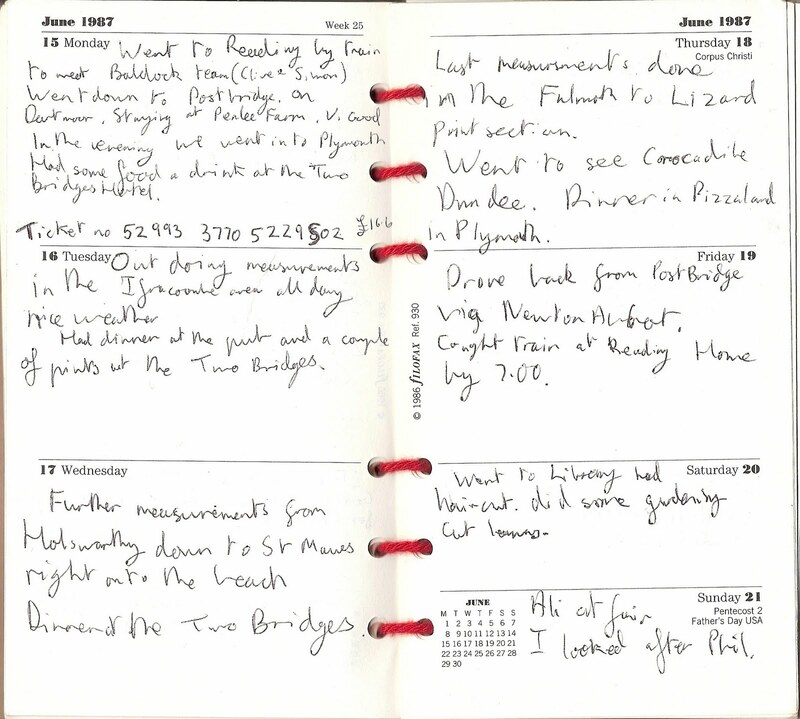 I bought my first Filofax in London in the eighties heyday, and I’m currently alternating between a black Sandhurst and a brown Crocodile Dundee, both in Personal size. 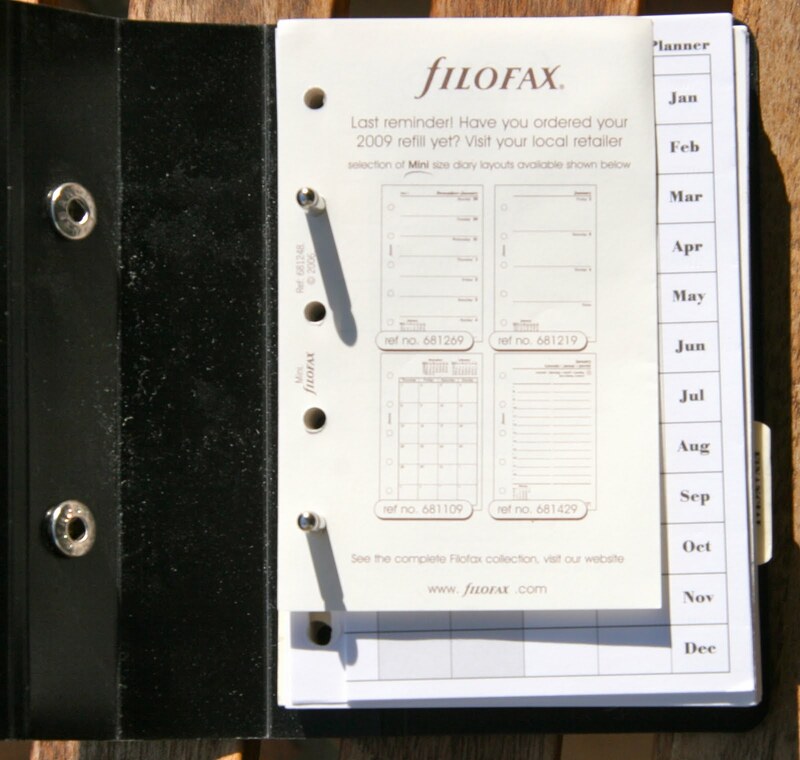 I have fond memories of the huge number of forms available then, so my second surprise after resurrecting the Filofax was to discover how few forms are now available. 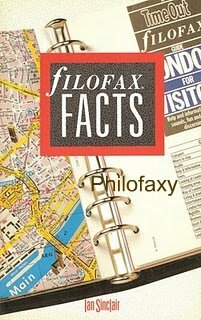 Recently I found Steve’s review of “Filofax Facts” on Philofaxy and since getting my own copy I’ve re-created some of the discontinued forms – and some newer additions – for printing on Filofax Computer Paper (Ref. 130806) to produce Personal size pages. Steve has very kindly uploaded these to the Files section, where you’ll find that each form is set up to produce three double-sided Filofax Personal pages per A4 sheet. The templates are in PDF format, and it's important to manually set up the print output, i.e. select A4 paper size with landscape orientation, and de-select page scaling, centring and rotation which Acrobat and similar programmes often enable by default. The Filofax paper is quite light, so I also suggest manually duplexing the sheets, allowing some time for them to cool down and flatten out between print runs in order to prevent jamming (thank you Imy for that great tip). Hopefully some readers will find these useful, and hopefully they’ll print out properly for everyone and generally behave themselves. If you try them out, please leave some feedback in the comments below. I’m also open to suggestions for new or improved templates of any sort, so again do please leave a comment. Thank you Gerard for your time and patience for creating these new templates. It's the middle of summer here in the Northern Hemisphere. We live our lives more outdoors...in swimming pools, parks, and gardens. For my mother's birthday last Saturday, I brought her some daisies to plant in the little garden under her windows. Friends are passing plants around..."Take this pot; it'll get more sun by your front door"..."I have too many lilies; dig some up and take them." Do you use your Filofax to keep track of your garden? What do you do with used diary pages or other inserts that you want to keep? I think some people use other organisers to store used pages. For Filofax A5, Personal and Pocket sizes Filofax sell Filofax storage binders. 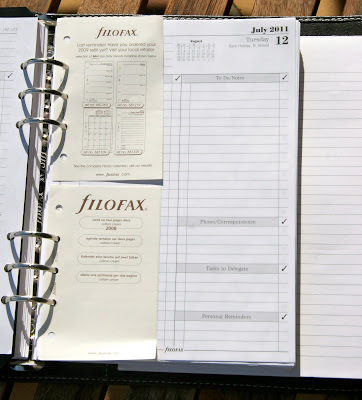 However one of our readers asked me a question about storing Filofax Mini pages. Sure she could use another Mini organiser, but they are quite small to start with and therefore they don't hold that many pages. The hole spacing on the Filofax Mini pages is the same as Filofax Pocket pages, but only 5 holes rather than 6 holes. This means that you can slot Mini pages in to Pocket size including the Pocket Storage binders as shown in the photograph above. But did you know that Mini pages also fit Filofax A5 binders too and you can fit them in two rows as it were, without overlapping and they only overlap the upper and lower edges of the A5 page by a couple of mm so this is another possibly viable solution for the bulk storage of Filofax Mini pages. I'm not sure if this was a deliberate design thing by Filofax or it is just a 'by chance' thing, but I think it's quite a neat solution! My own solution to storing A5 pages was quite a simple one. Picture if you will, me walking around a French supermarket clutching a tape measure. Going from department to department looking for suitable size box. Nothing in the stationary area, nothing in household. I found one in the laundry department, and it's perfect and only cost €3 with a lid too. But it means I can store my previous years diary pages in the bottom and my unused inserts in the top, sorted! So this time Rori has stepped forward to go under the spotlight. She is relatively new to Philofaxy, having discovered us 'last fall' (Autumn). She is a busy lady being a mom of twins, planner addict, a lover of pens, paper, pencils, planners and film photography. But she still finds time to blog and be very active on Twitter. I bought my first Filofax last fall sometime, shortly after I started my first blog. The blog was called "redforrori", so I bought a personal size red Domino to match. I intended to use it only for the blog, but I liked it so much, it wasn't long before I was using it for everything. Soon after that I bought a pocket size Gooseberry green Domino and I used that as a wallet for a while. Addiction ensued. I've used so many things! 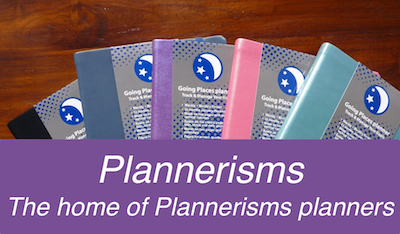 Franklin Covey for years (it was no bueno for me), Planner Pad (in several iterations, which worked ok), various and sundry box store generic planners (boring), and then after I found Philofaxy, a FILOFAX (or five)!! My favorite is probably still my personal size Cuban Zip, and that is primarily because the leather is so marvelous. Also, I used it for long enough for it to become a bit of a "lovey blankie" for me. A5 is my preferred size though, and I was blessed enough to be gifted with an A5 Finsbury in raspberry recently. I loveses it. Until very recently, I used the Cuban and then the Topaz for my main planner. However, I have since decided that the personal size just does not have enough space for me, and so I'm still debating the virtues of moving completely into the A5. Mid-year is not the best time to purchase Filofax inserts. The beauty, variety and function of the leather binders. I love the fact that you can carry all sorts of "stuff" around with you. My favorite blog posts about Filofaxes are the ones where people show their Filofax all "stuffy and fluffy". Better inserts! Nicer paper, different layouts (like the months WITH the weekly pages), and I would make the personal size inserts wider to be more useful. There's plenty of space in all my personal binders for wider pages! I adore the personal Ochre Malden. I probably won't be buying it soon, unless I find that I can work with the personal size again. The most I've spent was $99 on the Cuban Zip. Worth. Every. Penny. What's not to like? I've made the most wonderful friends within this community! People are kind, funny, interesting, and wonderfully accepting and encouraging. Philofaxy is also one of only 2 blogs I read every single day, despite being subscribed to many more. I don't generally download whole albums, but individual songs that I like. I love classic country, and some of the new country. The last 2 songs I downloaded were "Knee Deep" by the Zac Brown Band and Jimmy Buffet; and "Overnight Male" by George Strait (who is my babe ;o) , but I also really love Larry Gatlin, Marty Robbins, and Chris LeDoux. Thank you Rori for agreeing to go under the spotlight. So as we enter the last six months of the year do you start to question or wonder what diary should I think about using next year? 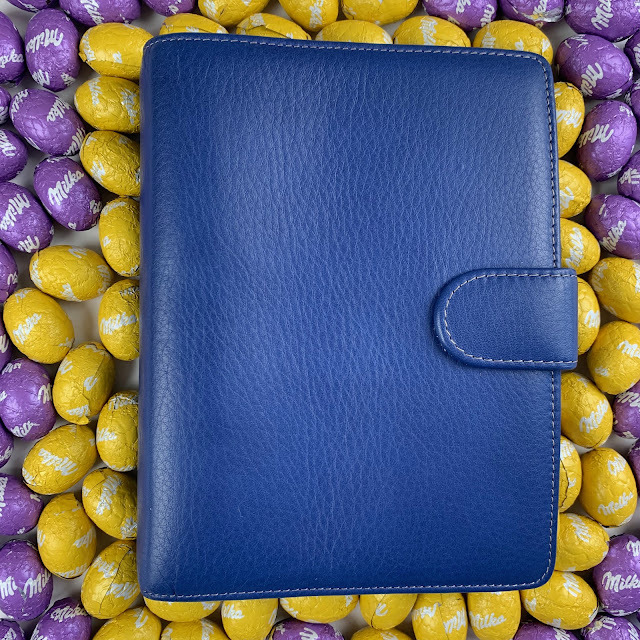 But whatever your choice might be, fire away with any Filofax questions you have for us this week. So last weekend a group of our friends met up in Rotterdam to get together and share their Filofax experiences. Thank you to Alice for organising the event and to everyone for sending in this rather detailed account of their meet up and additional thanks to Alice for all the photos. I arrived a bit early and hence was first, since I was one of the participants with the shortest routes (about one hour of driving). However, about five minutes later, Alice came in as she had been admiring the Soul group that was playing on a podium just outside the Cafe. (I had so too, these guys were really good!) There was some kind of city festival going on with several locations in the city where musicians were entertaining passers-by. Did I mention there is always something going on in Rotterdam? Not too long after Alice coming in we were joined by her husband Eric and daughter Isabel. Next to arrive was Femke, followed shortly after by Judith. Paulien unfortunately was unable to make it and so was Steve. We really missed you guys! Eric observed that actually complete strangers are meeting here and yet I couldn’t say that it felt that way. We shared a common “hobby” and had chatted extensively on Twitter. But that’s definitely proof that we live in the 21st century. The new way of social interaction. But I am straying off topic. So we settled down, ordered our drinks and out came the organizers. I had only brought my Hunter, as the only other organizer I have (a plastic Samsonite) was nothing to shout about. In my parents place in Austria there are two more, but both are no-names (one of them being my first ever paper organizer, which I bought at Aldi when I got to College). But the ladies more than made up for what I lacked and their collections were really astonishing. I was impressed by the quality of the red Malden that Femke used as a daily planner, but I especially liked a cocoa brown Finchley that Judith brought along. That would be exactly my taste. Lunch was ordered and I have to say the food there is really great. If you’re in Rotterdam, make sure to drop in. Prices are affordable too. Again Cudos for Alice who proposed the place! Fantastic discussions ensued about accessories, organization methods, color coding, the choice of pens and last but not least the question if you should use one or several planners for your live. But we soon realized that we had way too much to talk about to do any shopping at all, as the first of us would have to leave around 15:30 for other appointments. So came “piling time” and even Isabel was so kind to chip in with her Domino in ultra violet. Thanks again for that! I had a great time with you folks and I am looking forward to the next meeting, which we intend to have around the same time next year. I don’t have much to add to Rene’s write up, because he has written most of it! The one thing that stood out for me was that we all were comfortable with each other, like we did this daily. Like Rene said, we have a common hobby, we felt comfortable with each other from the second we met and the chatter never stopped! I was impressed by Judith’s ability to fit her whole life in a pocket Malden and that got me thinking of how I should try it again some day, I also loved the A5 Dodo pad that Alice had in her A5 Success and I may buy that to use for my Control Journal. It was great to see how everyone had different ways of organising. I did however decide that next year I will be using Cotton Cream paper, oh the luxury of it! I certainly had some “AHA” moments. I was impressed by Rene’s 4 colour pen and the slim Pilot Frixion Judith carried in her pocket Malden (the only thing that annoys me with the Malden, my normal Pilot Frixion doesn’t fit in the pen loop!). Time flew by and we certainly had enough to talk about to last us a few days, but it was time to say goodbye (for now!). I was kinda glad that we didn’t go shopping so I could stick to my shopping ban (I don’t know if I would’ve lasted if we did! ), but I’m quite excited to go shopping next time we meet up. Because there will definitely be a next time, I had a blast! Thanks to Rene for starting this summary! We had a great time and this proves that meeting strangers can sometimes lead to many laughs! Thanks to Judith, I finally got to see a Deco in real life. I have been toying with the idea to buy one but since I never saw one, held one, the price was too high to “gamble.” Now I know what it looks like and yes, the odds are in the Deco’s favour! I loved the plastic index cards that Femke uses to make sub-tabs behind her standard tabs. The plastic tabs she uses allow her to split up a general section such as “notes” into categories. Isabelle and I loved them. Generous as Femke is, she gave her spare tabs to Isabelle and I thank her for that. Judith gave everyone a small notepad she had gotten online. It is a small pad that allows for scribbles but it does not block the whole page. Rene’s use of his senior Succes “Hunter” is basically according to the philosophy “one life one organizer” and his is well organized! He makes copious notes and lists but has the discipline to check off his to-do lists and remove passed calendar months from his organizer to keep it neat. Femke and Judith have organizers dedicated to a specific theme or need. That made me think about the way I use my four books. I have one A5 “one life in almost one organizer” but need three other books for different purposes. My A5 Filofax Sketch serves to store supplies and older pages removed from my A5 Succes “Dolce Vita.” However, it also serves as the book in which I write notes when I study a law book. My leather “no name” personal Filofax from the 80s serves to help me organize the cases I work on. It now has two sections with cases to research and those I just need to update. Both have ABC-tabs with different sheets being it to make notes. Since it serves as a reminder to me I use up all different kinds of (personal size) paper in this book. My “store brand” personal organizer will become the family address book. We have a not-updated one next to the phone and of course, address lists on smart phones, laptops, etc. I intend to collect all addresses, compare them, update and make one big book of addresses! We will most definitely do this meet-up again and now that we have met, a shopping spree will be easier to organize. We most definitely will stay in touch via Twitter and of course, Philofaxy. I think some of us are on LinkedIn as well. I hope that when we have the next get-together, I will be in the Netherlands (I live in the USA) so I can come too. Thanks Judith, Femke and Rene for a great Saturday! I didn’t find the Cafe at once, but as long as I have my mouth, I will get everywhere (LOL). When I entered, there were some people at a table waving at me. With Filofax binders! Phew, I arrived at the right place thus! It was most peculiar that I sat down at a table with people I had never met before, and we all started chatting as if we met at this place at least once a week for the past several years. Amazing! I had a great time, and time really flew by. Lunch was very nice (I had a very yummy salad! ), the cappuchino was perfect as well. I loved how serious Isabelle was about her own Electric Blue Domino. She made a list of the shops and brands we mentioned, where she could buy coloured Personal sized note paper. I think this 10 year old will look into a very bright and successful future! Obviously, the comparison and browsing through the various Filofaxes was so much fun. Something a non-organisational freak would never be able to truly understand. My DH for one thinks this is the weirdest thing since the invention of Blood Icecream (which - believe it or not - was actually produced last year! Yikes!). Although Alice’s husband took off to the book store at some point, he did share and contribute to many discussions about the virtues of planners vs phones. And we all learned so much about life in the USA along the lines! Especially, about lack of postal services LOL. Anyway, at 15.30 h everybody had to go someplace else, and Femke and I walked to the Railway Station together, before I started my 2.5 hour journey back. Again, time flew by, and I felt really elevated by this meeting. I am so looking forward to the London meetup in September! And I would love to meet my Dutch fellow-Philofaxers in July 2012 again! It looks like you had a great time in Rotterdam. Thank you once again for your detailed account of the event and all the pictures.